Georgia. Convention of the People (1861: Milledgeville and Savannah, Ga.) Journal of the Public and Secret Proceedings of the Convention of the People of Georgia: Held in Milledgeville and Savannah in 1861, Together with the Ordinances Adopted. 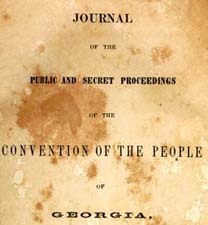 Journal of the Public and Secret Proceedings of the Convention of the People of Georgia: Held in Milledgeville and Savannah in 1861, Together with the Ordinances Adopted. Milledgeville, Ga.: Boughton Nisbet & Barnes, state Printers, 1861.